What follow are entries that I posted on another blog over the summer. 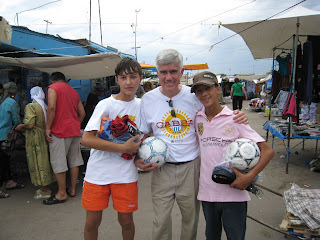 While the postings now show October dates, my actual trip to Kazakhstan was June 22 - July 7, 2008. Greetings from Kazakhstan! This has been the first chance I've had to really write much since my arrival, so I thought I'd let you know how things are going. I'm sure that I won't be able to include everything that's happened, but I hope that this gives you some flavor as to the trip so far. The journey to Taraz, Kazakhstan took about 24 hours from door to door. I flew to London, then Amsterdam, then Almaty. My flight from Amsterdam was delayed, so I was a bit worried that my luggage wouldn't make it. As soon as I got off the plane in Amsterdam, I raced to the other terminal where my next flight was already boarding. I boarded without any trouble and ended up sitting next to a very nice Kazakh lady who gave me a few tips. I did manage to get some sleep, but not a lot. The six and a half hour flight landed on time in Almaty at 5:10 AM. I got through Passport Control without any trouble and headed for the luggage claim area, hoping that mine had made it. As it turned out, mine had already been offloaded and was sitting on the floor. I suspect that it was one of the last bags on the plane and therefore one of the first off. I was told that after I exited customs that I would be met by a driver. I pressed my way past a herd of taxi-cab drivers all insisting that I ride with them. I was looking for someone that was holding a sign with my name on it, but I saw no one. Maybe he was late, I thought. Just before I got to the door leading outside, a guy approached me. "Mister Steve?" he asked. He was holding a piece of paper. I pointed to it and he unfolded a printout of my photograph and some telephone numbers. He didn't speak English, but we managed to exchange pleasantries and he lead me to his car. The parking lot was jammed and people parked wherever they wished. Many of the exits were blocked with cars, but after about ten minutes we managed to find our way out. I was told that the ride would take anywhere from six to nine hours. After about thirty minutes, we found ourselves in fairly flat and not so scenic territory, so I layed down in the back and thought I would try to get some sleep. The roads were extremely bumpy and full of potholes, but I was so tired that I managed to fall asleep for a bit. After a couple of hours I sensed that we were pulling over, so I sat up. We were at a roadside restaurant. He led me inside the rather large outdoor seating area and he ordered from a menu. I had no idea what he was ordering for me, but hoped that it was nothing too "exotic." First, some bread and tea arrived. He swished some tea around in our cups, splashed it onto the concrete floor, then poured me a cup. He also wiped off our silverwear with a napkin. A few minutes later some soup arrived. He told me that it was "rooskie borscht." Having been to Russia, I recognized the beef and vegetable soup and was happily enjoyed my breakfast. We also took a restroom break at the restaurant. The concrete building was full of "squatty pottys" which were nothing more than large slots in the floor, and I was relieved that my task there required only standing! We continued our trip, with me doing a bit more sleeping. I was suprised that I arrived we arrived in Taraz in record time, no doubt due to the significant amount of passing we had done on the bumpy two lane road. Now you know the real reason I was lying down in the back! We pulled up to a two-story white brick building with a black wrought-iron fence around it. The ironwork in the center of the main gate had been fashioned into a heart, which is part of the Interlink Resources logo. The driver led me into the building, where I was warmly greeted by the staff. I soon met Sara and Beth, who had arranged for my visit. They gave me a brief tour of the building and led me to my guestroom upstairs. I was very impressed by how modern everything was. I could have easily been in an office in Indiana. I was especially pleased to see that my room had a very nice shower! I don't remember whether or not I had lunch first, then showered, or the other way around--but both the shower and the lunch were both much appreciated!I had been traveling for over 24 hours and was in definite need of an energy boost! I later met with Beth and Sara and we discussed their plans for me during my stay. Interlink resources wished to produce a new promotional video and they wanted me to film examples of their various outreaches and to conduct on camera interviews with key personnel and partners. We discussed several ideas, then I took a much needed nap. Later in the afternoon, we ran some errands with one of the staff interns, Ember, then went to Beth and Sara's place for some delicious homemade Thai food. After some enjoyable food and chat, Sara took me for a walking tour which included a visit to the main square in Taraz. As we approached the large square, flanked by large pastel colored buildings, to our surprise, we heard what sounded like gunshots. As we got closer, we found ourselves at a huge "Honor Our Police" type of celebration. Hundreds of policemen filled the square. The crowd surrounding them clapped politely as various divisions of police marched, rode on horseback, or zoomed through the square with their squad cars. Also included were a tank and some sort of anti-riot vehicle with a water cannon. There were a couple of somewhat amusing demonstrations--one of a mugger being swooped up by two policemen on horseback, and the other of the traffic cops twirling their flashlights. We remained until the end of the demonstrations and then some local singer was introduced. 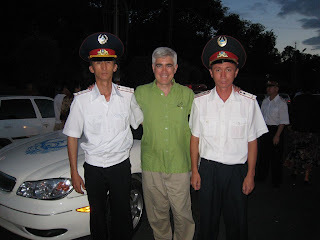 As we began to leave the square, Sara suggested that I ask to be photographed with a couple of policemen. I said that I was happy to give it a try and so she approached a couple of policemen and asked on my behalf. They seemed quite happy to be a part of a photo and soon I found myself surrounded by some of Kazakhstan's finest near their new squad car. We had a nice chat and they seemed genuinely happy to meet me. As a matter of fact, ever since my arrival in the country, everyone had displayed an overt friendliness and hospitality. 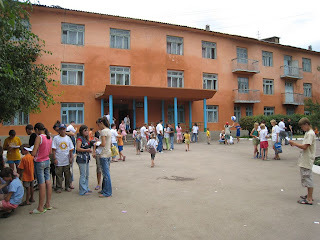 Tomorrow I would be going to Savva orphanage and suspected that the people would be no less kind there. 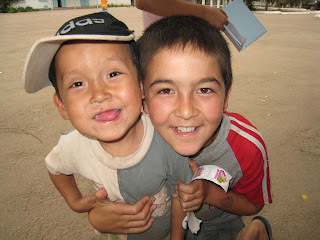 More importantly, I would finally get to meet the children that Interlink was working so hard to help. After returning to the guest room, I quickly fell asleep, grateful to no longer be trying to rest in a cramped airplane seat or in the back of a speeding Audi. I knew that I would need my rest--not only in order to take good video, but also in order to cope with the emotional ups and downs that surely would be a part of my visit to the orphanage. The smell and sound of coffee brewing once again woke me up at 5:50 AM. I was glad that I had slept well, but wondered how many others had. They had spent a lot more time with the kids than I had and would be much more emotionally attached. I joined the delegates for a prayer walk around the perimeter of the orphanage and watched as the kids began coming out. Normally they wouldn't be out quite so early, but they knew that today the delegates would be leaving right after breakfast. I wondered how I would react. Sara had warned me that as soon as the bus pulled up things would be harder. After breakfast I taped another interview with one of the kids. As we walked back towards the main building, the red and tan coach approached. Sara was right--the sight of the bus caused my emotions to accelerate. I took a deep breath and took comfort in the fact that I would not be on the bus (I would be riding home with Sara shortly after) and that I would be returning a week from Saturday to do another video workshop. The boys began carrying out the suitcases and boxes, some barely able to drag them, others balancing things on their heads. In between packing, the delegates and kids chatted, hugged, and cried. Some of the kids that I had talked to came running over. I gave them a hug and told them that I would be back soon. I videotaped mostly from a distance, not wanting to invade the privacy of those sharing what could be their final moments together. We had been told to try to keep things as upbeat as possible, and for the most part, it was. Some of the delegates held two or three kids in their arms. Others smiled and talked. The team leader, Jim, had told everyone that as soon he said "it's time to get on the bus," then everyone must quickly comply. I wondered how I would have reacted had I not been videotaping. The dreaded words finally came. Some immediately offered a final hug and smile, others could not quite let go. Jim and Sara had the task of prodding the stragglers, and it was probably another five minutes before the bus was loaded and ready. Dozens of young faces stared upward into the heavily tinted bus windows and tried to get a final glance of the visitors who had meant so much to them. 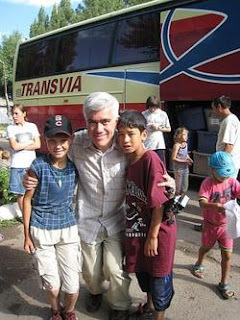 I videotaped as the bus drove down the dusty lane and out of the orphanage. I took another deep breath and headed towards the main building. I had about five minutes to get my things and get back to Sara's car. I noticed that one of the boys who I had interviewed was having a tough time. I put my arm around his shoulder and walked him back upstairs to his dorm floor. I said a few more good-byes and got a few more hugs as I worked my way back to Sara's SUV. I was honored to have visited Savva and was already looking forward to visiting again. Sara and I pulled onto the main road and headed out of town. We needed to stop at a nearby sanitorium where some of the kids from Savva had been assigned. I wasn't quite sure why, but it had something to do with TB prevention. It wasn't long before we arrived at the fairly modern pastel yellow buildings and found our way to the proper floor. The interior was very clean and modern, and looked as though it wasn't more then five year old. The kids from Savva were rounded up and greeted Sara warmly. "Sara! Sara!" they called. After a mini hug-fest we handed out gift bags containing some toiletries. The kids were all very excited and eagerly looked through the bags. We couldn't stay very long because we had an appointment at a teacher-training center and didn't want to be late. Again, we said our good-byes and headed off down the bumpy road. Sara and I were heading to what I understood to be a college, where Interlink was training english teachers to teach other teachers, and so on. When Sara called to ask directions, she asked the woman if the school was on the right or left side of the road coming from Merke. She didn't know! As a result, we sped right by it, but some kind men at what appeared to be an auto repair place pointed us in the right direction. One minute later, we were there. The woman was waiting for us and led us upstairs to the classroom. The building was older and in the midst of getting an interior paint job. The smell of turpentine filled the halls. When we reached the classroom, about twelve students were seated around a table. They were listening to a song (I Want to be Your Hero?) in English, then singing it back. They seemed to be having a good time and didn't mind as I walked around the room taping them. Later, they did an activity that involved listening to a weather forecast on the radio, and another which required them to interpret or predict parts of the film "Les Miserables." From time to time during the lessons, we snuck off to another room and taped some interviews with the teachers. A couple had known we were coming and had already prepared remarks, which they were eager to share. They were very excited about the curriculum that Interlink had provided and looking forward to sharing it throughout the region. We were asked to stay for lunch, which we happily did. Since they were all learners and teachers of english, I was able to enjoy talking to them directly, without Sara having to translate. I found it ineresting that they asked me what year I was born. Sara later informed me that it was a typical Kazakh question. I was tempted to ask them in which year they were born, but I resisted. It was a delicious and very enjoyable lunch. Afterwards, we took some group photos, during which they practiced their slang. The most amusing for me was "see you soon, baboon!" I wondered where she had learned that one! After an emotionally difficult morning, it was nice to have an uplifting time at the school, and Sara and I left feeling upbeat. The trip home went quickly, and we were soon back at the office. That evening, I enjoyed another nice dinner at Beth and Sara's place. We had stopped on the way and gotten a roast chicken, which was quite good. Beth offered to walk me back to the office (I was still staying in the guest apartment there) and I enjoyed the fresh air. The town square (where the policemen had been on my first night) was alive with people. It was more or less a mini carnival, with a bucking bronco, some games, cotton candy, etc. It was all a bit chaotic, with roller-bladers and cyclists zipping right between us. Especially amusing were the remote control mini-cars "driven" by little children. Sometimes I wondered if the parents knew how to use the remotes! Beth and I managed to survive the square and continued to a little park. We ran into a couple of people from the delegation, chatted a bit, then continued to the office. It had been a long, somewhat emotional day, and I was all too ready to relax. So far, my trip to Kazakhstan had been wonderful. I hoped that the days ahead would be just as good.